We have designed TracPal to be as sturdy as possible. 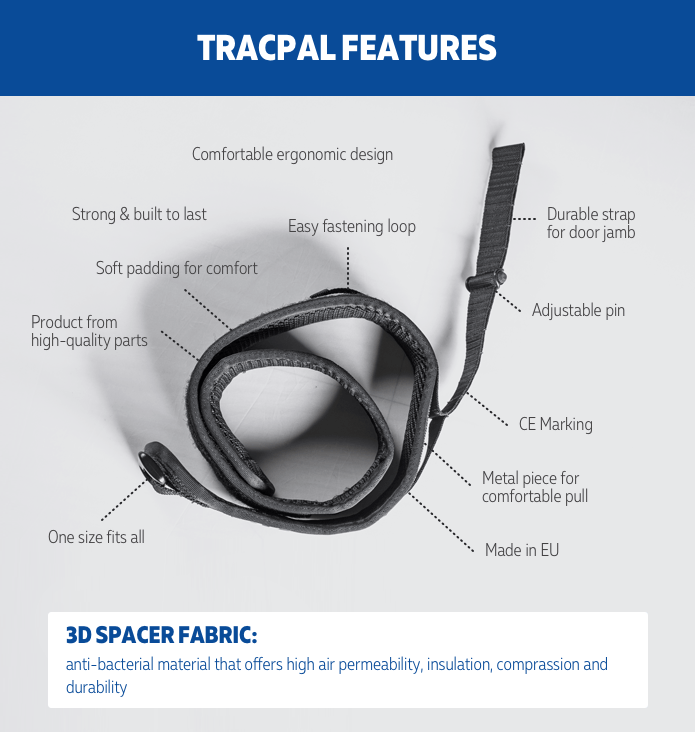 Thanks to the use of premium materials and high-quality production the TracPal device will last you a very long time. Joint traction is an old and proven method that has been used for musculoskeletal treatment since early days. Manual traction is a mobility technique accepted in clinics and used by physiotherapists, physicians, osteopaths and chiropractors to reduce pain and other symptoms. During a traction treatment, a care provider is slightly distracting the joint, allowing the joint-capsule to stretch which decreases intra-articular pressure giving more space in the targeted area. The knee and hip-joint contain synovial fluid that acts as lubrication between the moving surfaces in the joint. When the surrounding soft tissue is too tight or/and the movement mechanics are of a poor quality, the surfaces inside the joint can compress and experience an array of problems. One of which is that the synovial fluid gets pushed out of the joint-capsule and the joint cartilage is damaged because there Is too little space. This thinning of the synovial fluid and wearing away of the cartilage lead to the symptoms of osteoarthritis. As traction slightly separates the bones in the affected joint, it results in immediate pain relief and for nutritious synovial fluid to flow back to the joint-capsule, thus strengthen the cartilage and joint. The TracPal device helps to perform manual self-traction therapy of the hip joint (Long Axis Hip Traction) and the knee joint (Tibio Femoral Traction). Manual traction therapy is one important part of a line of combined options for treating hip and knee-joint disorders.therapy with a manual therapist versus using TracPal. The patient is positioned supine, with hip in slight flexion and knee extended. A belt or therapist’s hands are placed firmly around the patient’s ankles. Distraction of the hip can be produced by the therapist leaning backward, producing slight joint gapping at the femoral acetabular joint. This technique can be used for decreasing muscle spasm or pain, and is also useful to increase accessory joint movement for flexion and abduction movements. The patient is sitting with the leg hanging of a bench. The therapist’s hands are placed firmly around the patient’s ankle. Distraction force is gained by pulling down the leg along the line of tibia. This technique is particularly effective for pain control. Other positions may also be used to increase joint play and flexion.